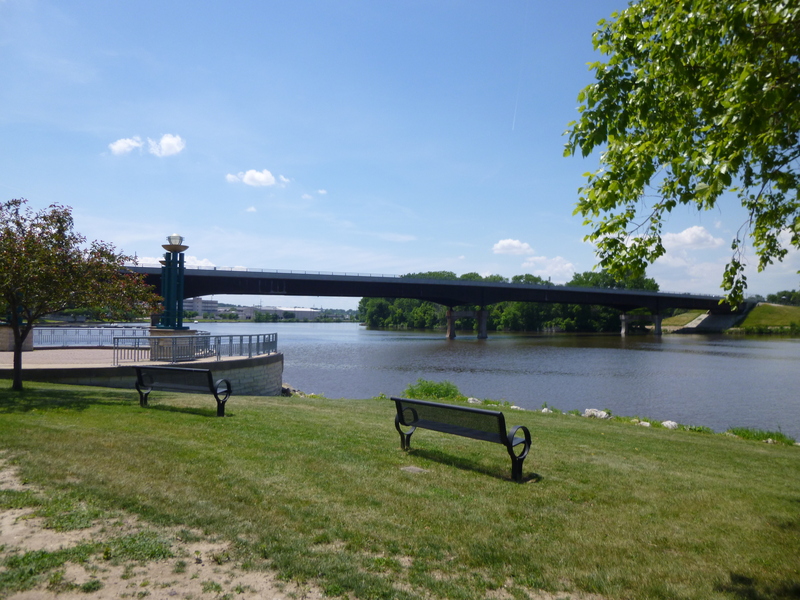 Since I had been following the Mississippi River for a while, I thought a food donation to the River Bend Foodbank in Moline would be an appropriate donation for today. So I went shopping for cereal and oatmeal, pasta and sauce, pork and beans, peanut butter and jelly, mac and cheese, and muffin mixes. I like to try to include Jiffy Corm Muffin mix when I can since it’s produced in my hometown. 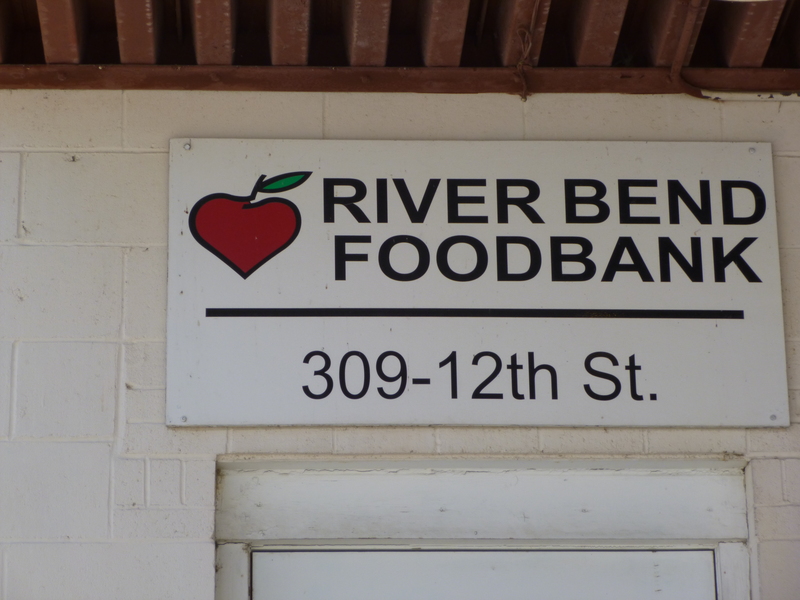 Then I found the River Bend Foodbank, and went inside the warehouse to find someone. It’s a huge warehouse, set up to take donations from individuals like me, or big donations from corporations. They appreciate it all! 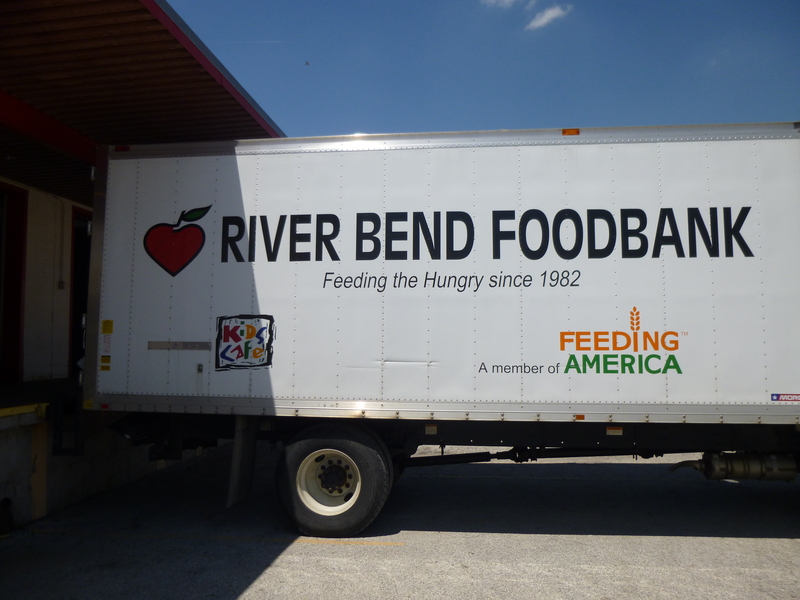 This foodbank has been helping people for over 30 years, and they partner with over 300 smaller food pantries in 22 different counties. They can store up to a million pounds of food safely and efficiently (my donation only weighed 55#!). 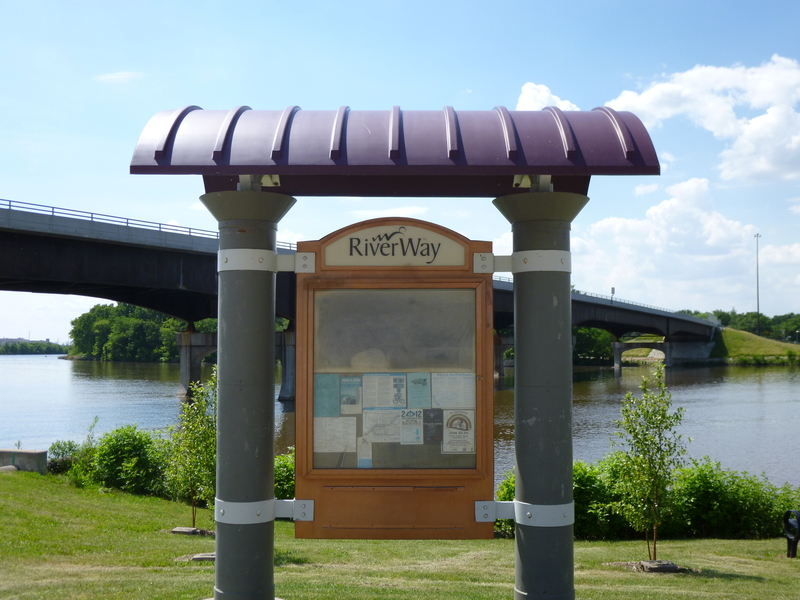 The guy who took my donation pointed me in the right direction for the river walk in Moline, so Tula and I set off for that, and got out for about 4 miles of walking along the river. 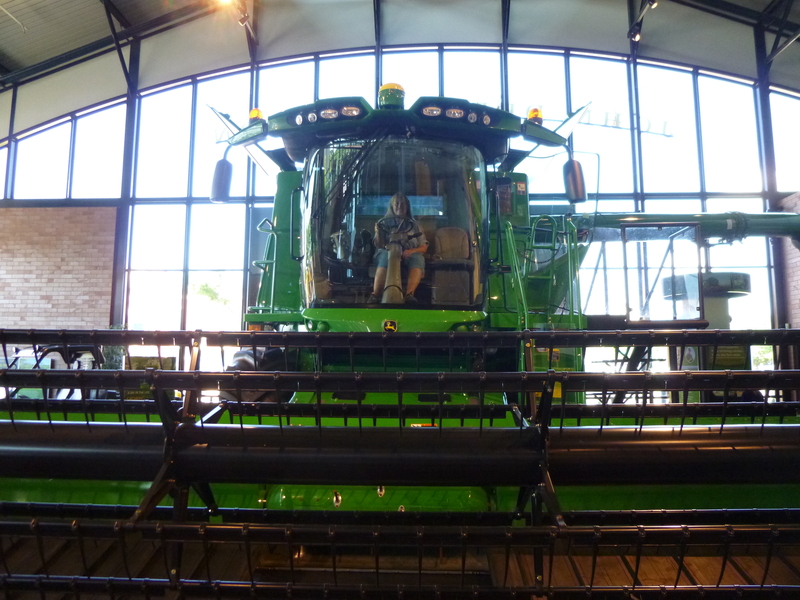 Then, since Moline is the home of the John Deere organization (and the town is known as the Farm Implement Capital of the World), I stopped by the John Deere pavilion and looked at all the amazingly huge and expensive farm implements. Many of the combines are run by automatic GPS systems for the most efficient planting and harvesting operations, and that’s partly why all the rows in huge fields are so straight. 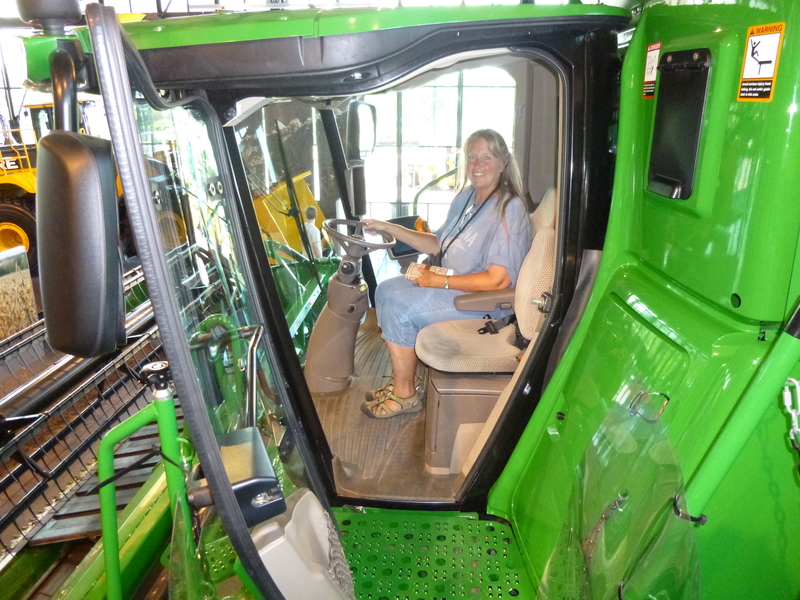 I climbed into the cab of the biggest combine, and it was full of technological stuff – I can’t imagine how long it must take to learn how to operate one! 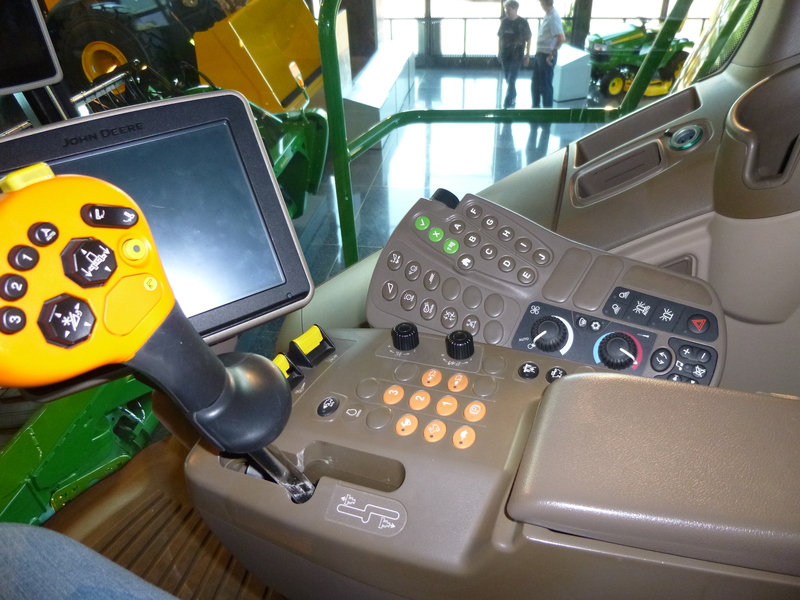 The on-board computer systems can even analyze the soil, and spread fertilizer, or other things, in only the areas it’s needed. 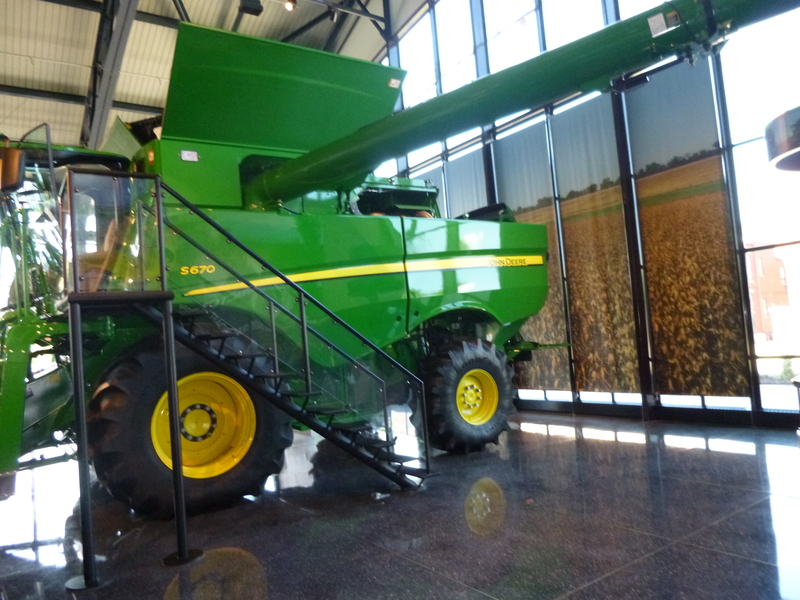 There was also an interactive computer system to “drive” your own combine and try to plant a field and harvest the resulting crops – let’s just say it’s a good thing I drive a van, not a combine! There also happened to be a really interesting video on how jeans are made and dyed (I think the video was there because John Deere makes a cotton-picking machine), starting from the cotton fibers, and going through the weaving (a ratio of 3 blue threads to 1 white thread) and cutting and sewing and coloring. 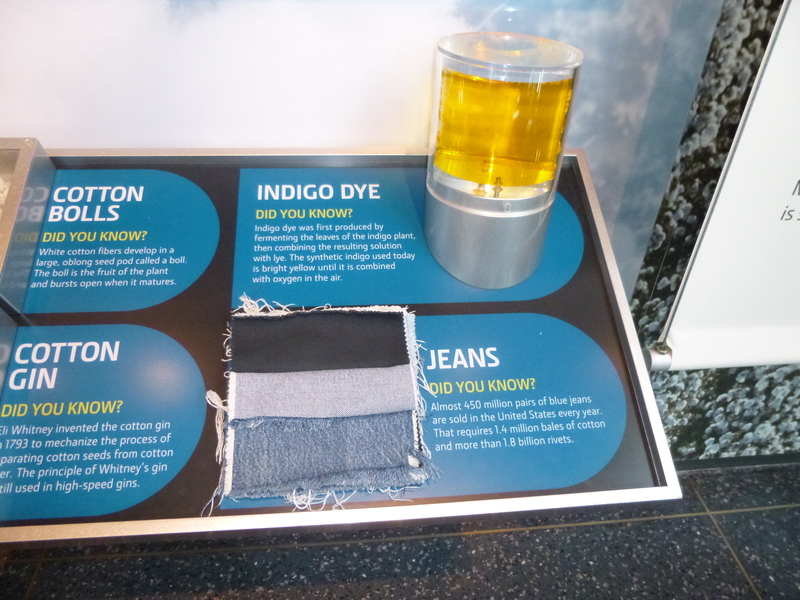 And apparently indigo dye is yellow until it’s exposed to oxygen. 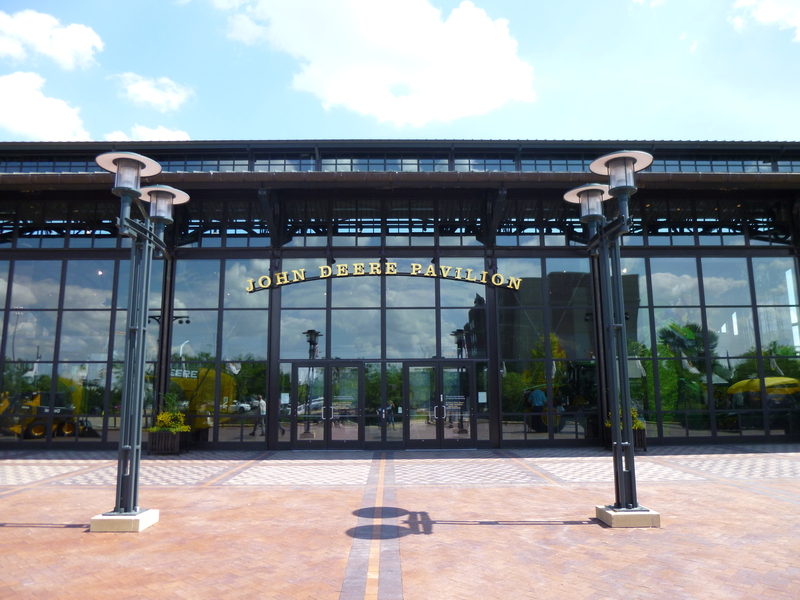 Once I was done at the John Deere Pavilion, I wanted to get over to the Mississippi River Visitors Center, and that was located on Arsenal Island, which is a military place. 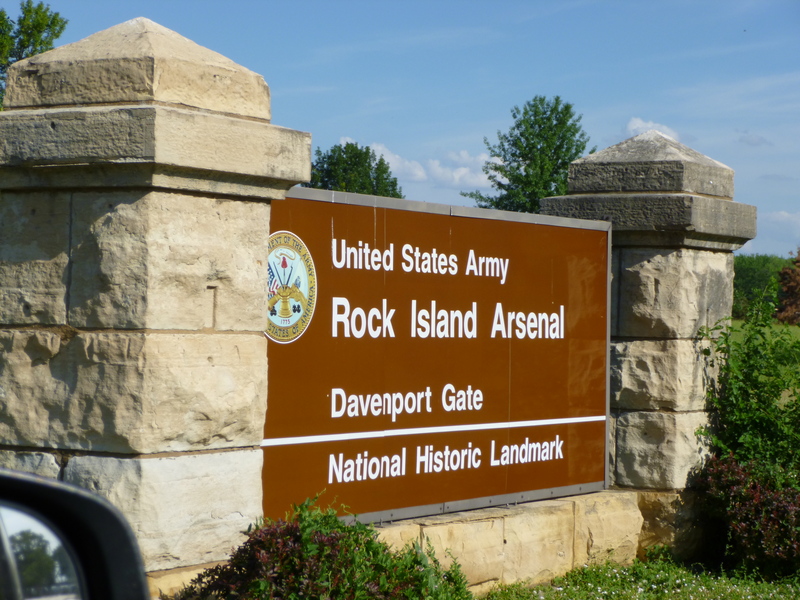 My AAA book says the Rock Island Arsenal is the government’s largest manufacturing arsenal. So I had to go through a checkpoint to get to the visitor center. 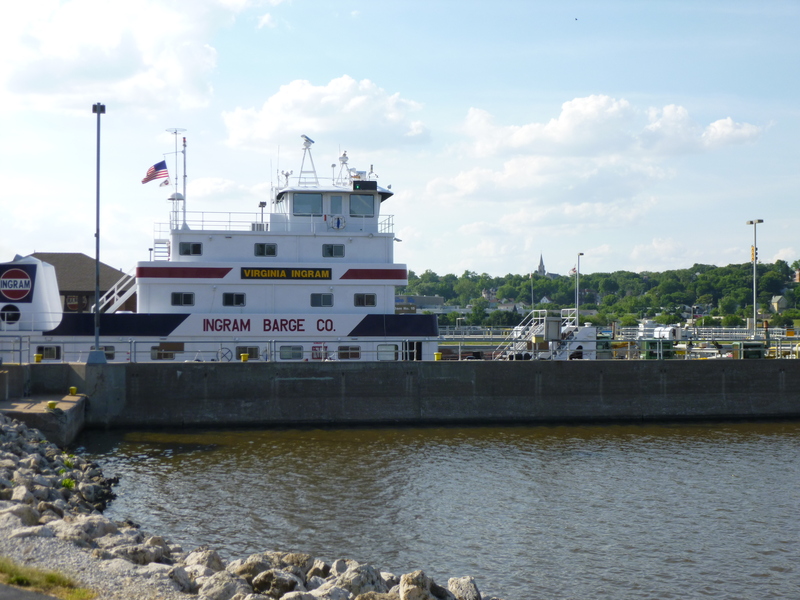 As luck would have it, some barges were in the process of going through this particular lock, and there’s a viewing platform right outside the visitor center for a birds-eye view of any boats and barges that are going through the lock. But, I was only there for about 15 minutes when the visitor center closed, and then I could only watch through a fence. 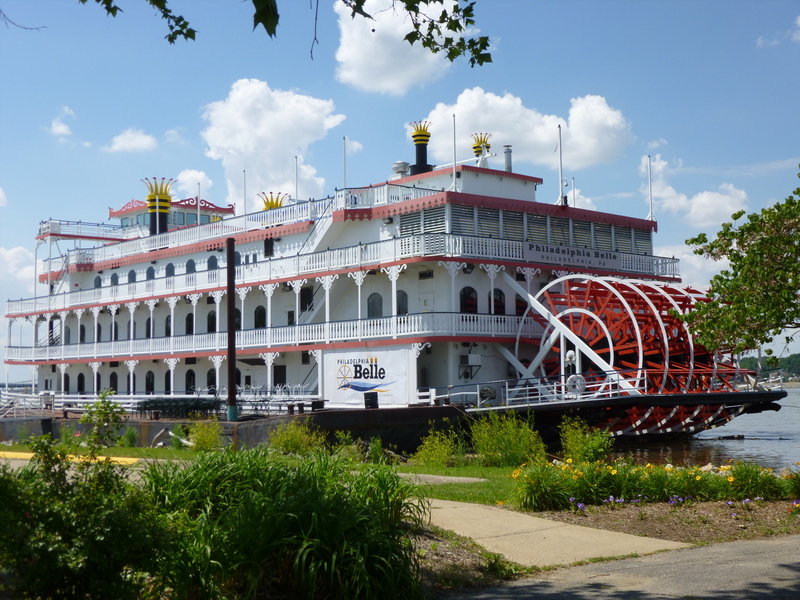 But there was a pretty good view, and there was another lady there who was explaining to her friends that when the string of barges is too long to all fit in the lock at the same time, it becomes a much more time-consuming process because the first group of barges is pushed in by the boat, which then backs out; the water level is raised; the barges are winched out since they don’t have their own power; and then the process is repeated for the next group…and then repeated at the next series of locks. 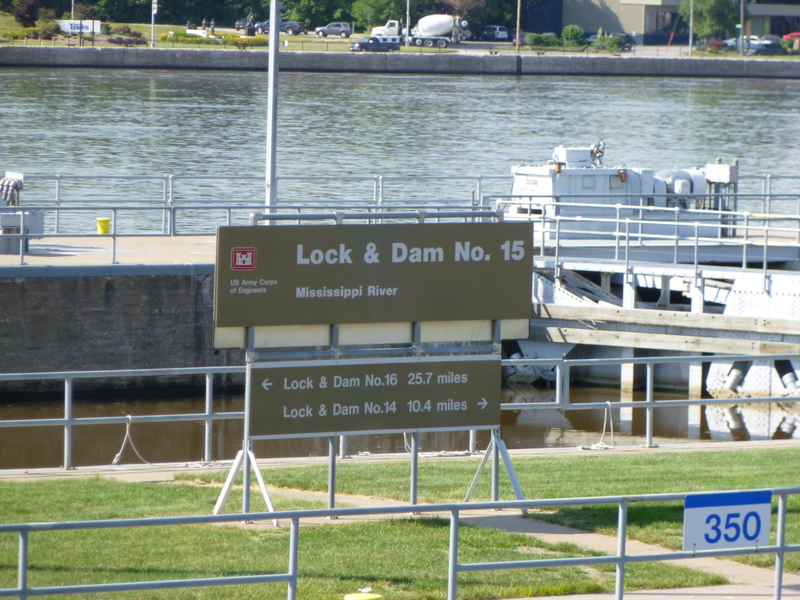 I was at Lock #15, so they have to do this at least 15 times going all the way up the river, and I’m guessing there’s more than that! 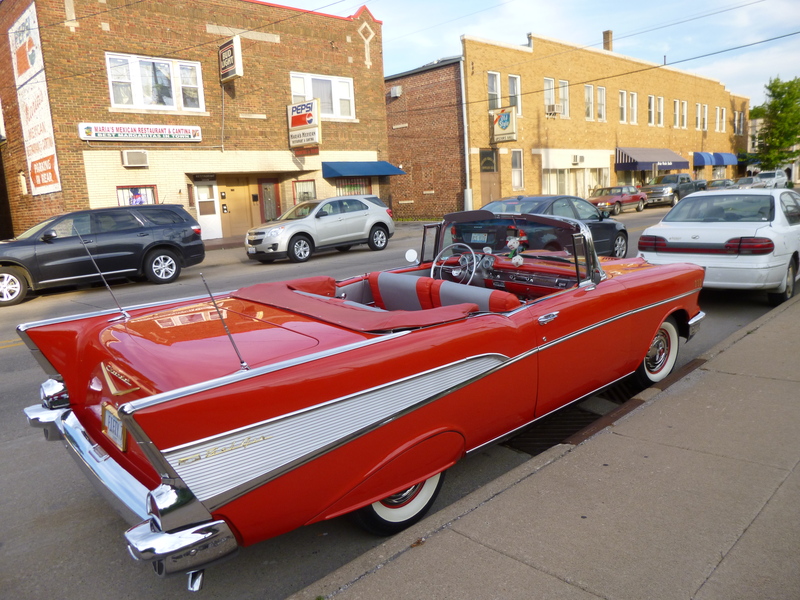 And then I needed to finish off my walking for the day. 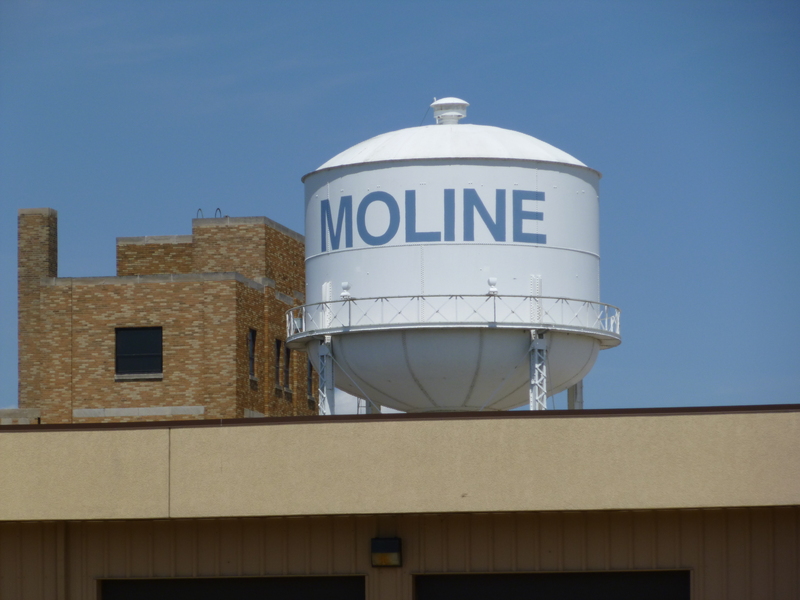 I never made it out of Moline since there was so much to see, but the Belgian Olde Towne area, and some old German and Swedish neighborhoods gave me lots of good walking places, and I got another 4 miles done – about half of it with Tula. 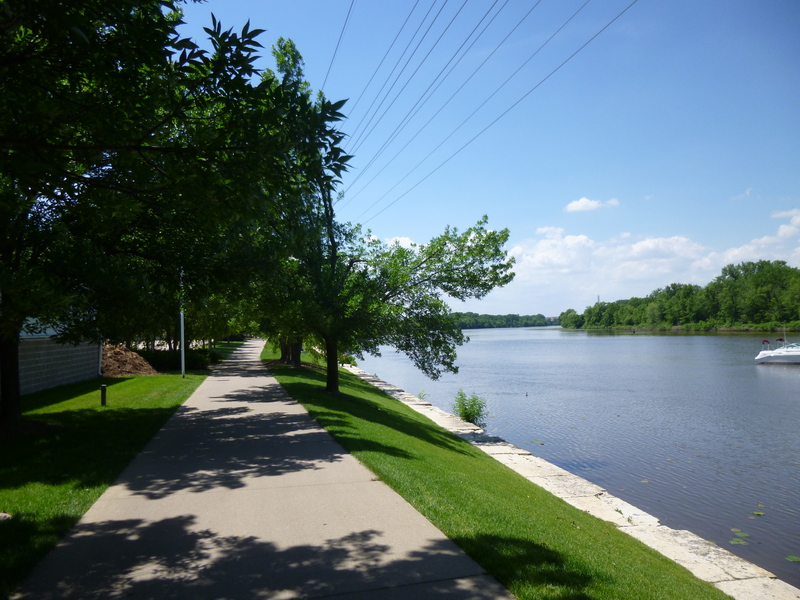 It was a pretty evening for walking, and the city parks were full of people playing soccer and softball. And then my time in Illinois was finished. 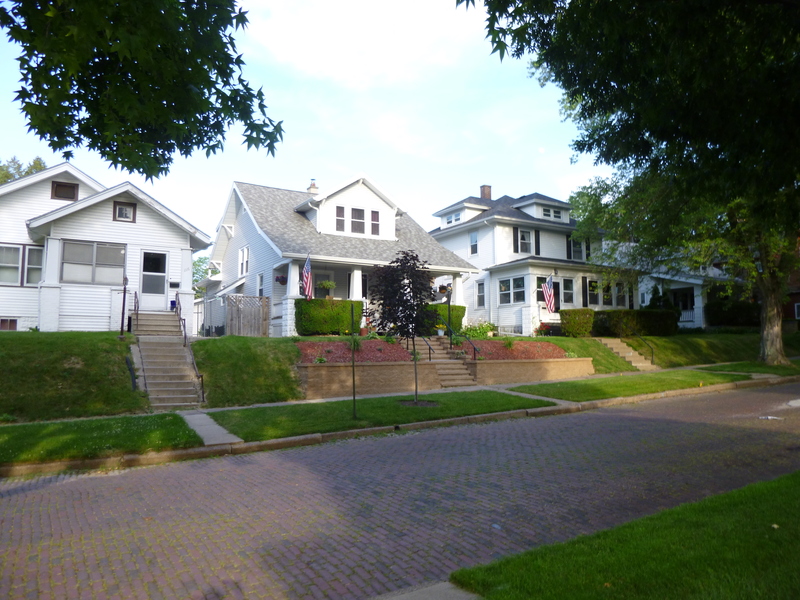 I walked all 56 miles walked, and made 7 donations – Bravehearts Therapeutic Riding, Freedom House, Isle of Erin Irish Dance fundraiser, Lincoln Home National Historic Site, Madonna House, Illinois Veterans Home, and River Bend Foodbank. Illinois was a pretty state to drive through, and now I’m ready for State #38! 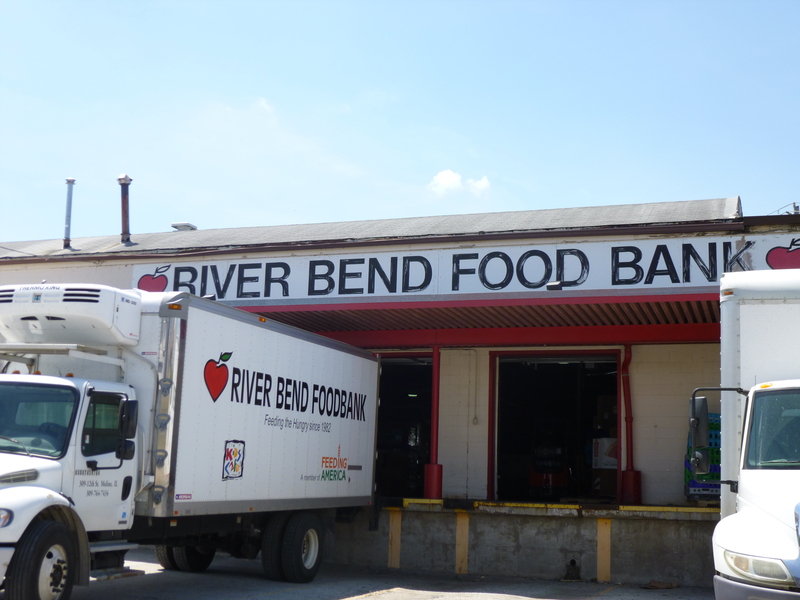 Thanks so much for your kind words about the River Bend Foodbank! And also for your generous donation of food. Together we can solve hunger!